The International Triathlon Union Reconsiders Its Rainbow Propaganda Rule After Backlash, but Why Was It an Issue At All? The International Triathlon Union (ITU) is aware of articles published recently suggesting that our institution is banning the rainbow flag at our events, and would like to clarify our position. The ITU has always stood for equality, inclusion and respect, and would never knowingly take such a decision that would infringe on the rights and freedoms of people to express themselves and banning the display of rainbow flags. In light of the misunderstanding, ITU will immediately revisit the rule to ensure that individuals’ rights of expression continue to be embraced. ITU regrets that this interpretation of the updated rules could have affected any person. It was never ITU’s intention that anyone could be hurt by this decision, one that was never intended to be taken against any group of individuals, no matter their race, religion or sexual orientation. ITU is proud to be an organisation that is absolutely inclusive from its inception, and will continue to be so in the future. While the ITU statement labels the interpretation as a “misunderstanding” it was ITU’s first statement in response that strongly suggested it in the first place. 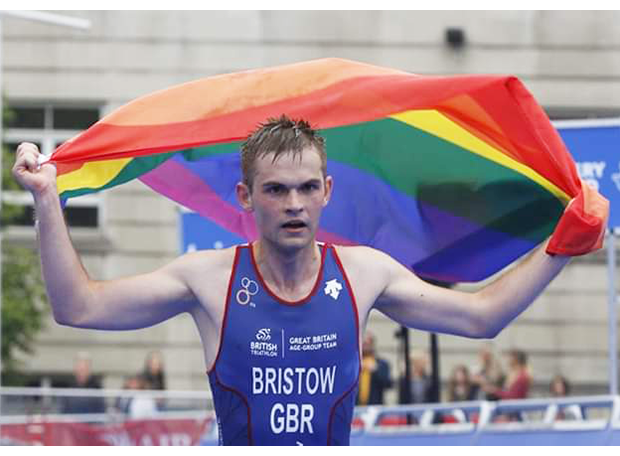 According to Outsports and Team GB athlete Jack Bristow, British Triathlon stated that it was adopting the new policies which include not just displays of the rainbow flag, but also rainbow laces, rainbow bracelets and tri-suits/ uniforms representing LGBT sports clubs. Triathlon is a sport that has always tried to avoid controversy. It is one of the few sports that hasn’t found itself in some kind of monumental struggle over performance enhancement substances, allegations of match fixing, political protests or anything else. The sport enacted this policy to try and distance itself from the potential of such controversy arising. Are they afraid of a triathlon version of John Carlos and Tommie Smith? Or another Colin Kaepernick? The ITU is trying to keep politics of out the sport, and while nobody wants to see “*insert name here* for president” or a nativity scene in a race. They are walking a fine line toward keeping the sport neutral and open to all from alienating entire populations of athletes who might choose to take up another sport all together. Triathlon is one of the fastest growing sports, with its challenge of combining three sports into one (swimming, biking, running) along with a variety of distances from the Sprint to the Ironman; it has become quite popular in a very short amount of time. However, according to the 2016 USA Triathlon Membership Survey Report released by USA Triathlon which reported 12,293 people who completed the survey. 65% of the respondents were male while 35% were female, 10379 out of 12293 or 84.4% respondents identified as White/Caucasian. The next highest racial demographic being Hispanic/Latino at 623 out of 12,293 or 5% with a total of 15.6% of people total who did not identify as white/Caucasian. In addition, 72% of respondents reported that they had an annual income level higher than $60,000 and over half of the respondents higher than $100,000 a year. It is clear that triathlon as a sport has a major issue with the screaming lack of racial diversity and representation of minority communities. Based on these results, triathlon is primarily for white, conservative, middle to upper class people, predominantly male. There is very little representation of people of color or members of minority communities. There was no data on the representation of LGBTI athletes within the sport, but it is likely not very high either. While the ITU wanted to avoid controversy, it only helped create it by choosing to exclude anybody who doesn’t represent the majority in the sport. It’s more than just a rainbow flag, what if it’s a Hijab? Or a glove? What if it’s a team uniform representing a gay triathlon club? Could events like the Gay Games still host ITU sanctioned triathlons? I mean, an event called the Gay Games would certainly break that rule. Is the ITU really concerned with opening up to diverse communities by allowing athletes to channel the best of who they are into their performance? When you limit athlete’s self-expression, you inhibit their capabilities to perform at their best. Triathlon is not an easy sport, nor is it cheap. Athletes train for hours a day, all year round to compete in only a handful of races. It is a huge investment of time, energy and money for an athlete to finish a triathlon. A rare moment that invokes a strong sense of pride and accomplishment. Crossing the finish line knowing you conquered that race, whether it is a Podium, PR or just finishing is such a wonderful feeling. It’s what makes the hard work worth it. It is up to the International Triathlon Union to show that they respect the “rights and freedoms of people to express themselves” of athletes and help them get to that finish line without having to worry about whether or not they are too gay to cross it. Make your voice heard! Sigh Jack Bristow’s Petition here!